Tuscany may not look very big on a world map but its size is deceptive. Mountain roads lengthen journeys and the only real way to visit many parts of perhaps Italy’s most beautiful, and certainly most varied, region is to locate a base and stay there for some days. We found Manciano fitted the bill perfectly. Equidistant from the mysterious ‘tufo’ towns of Pitigliano, Sovana and Sorano, the natural beauties of the lagoon of Burano and the wild beaches beyond it is located among the rolling hills of southern Tuscany – a region perhaps as neglected by the impatient tourist as our part of northern Tuscany once was. We chose an agriturismo a little distance outside Manciano with a very good price and a friendly ambience. This morning, for example, we had breakfast in the garden which overlooks a deer park, part of the animals kept here which also include chicken and goats. It was lovely to see the deer, with some prized horned specimens having their breakfast too. Our room was well-appointed and it was amazingly booked just a few days before the mad rush of Ferragosto, the Italian Bank holiday, when it’s impossible to find anything decent, especially if it’s near the sea. After a standard drive down the Via Aurelia we branched inland at Albinia and reached our base after a journey of around four hours. Traffic was light and the countryside of La Maremma quite glorious with irs rolling hills, vast panoramas, umbrella pines and golden fields. It was difficult to believe that this area was once considered ‘maledetta’, cursed, because of the lack of proper drainage and the high incidence of malaria. Yesterday we started off with an excellent continental breakfast of home-made ricotta, peach jam, cake, yogurt and caffé-latte served in the delighful early morning sunshine of the farmhouse’s garden. We then set off to Manciano’s centro storico. The steep narrow streets led us to the main church and, near the top, to an excellent museum which gave us an insight into the history of the area. There has been a settlement here since the Old Stone Age and Manciano became an important centre under the Etruscans and Romans. The castle keep (cassero) at the top is the home of the town council and it was very windy on the terrace surrounding it, giving us splendidly clear views of the surrounding country. There was an interesting art exhibition nearby. We proceeded to Capalbio, an even more spectacular southern Tuscan hill town with its ultra-steep streets and charming corners. The Romanesque parish church has some beautiful old frescoes and the views from the town extended towards a truly blue Mediterranean. There was a great walk around the town walls. 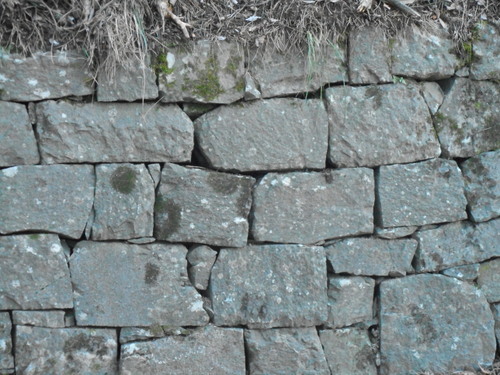 I wonder if Capalbio was ever captured with such strong defences which included an outer wall as well? The climax of the day, however, was yet to come! Have you ever felt mysterious presences when walking through a wood or experienced unexplained occurrences in your home? Have you actually sighted strange beings? If so, you’re definitely not the only one. 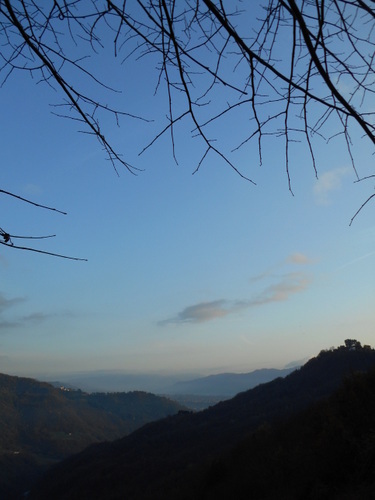 Here in the Mediavalle and Garfagnana areas there are many arcane powers and none so able to describe them as forest ranger and keeper of the regional park of the Apuane Mountains, Bartolomeo Puccetti, and archaeologist and explorer, Simone Deri. 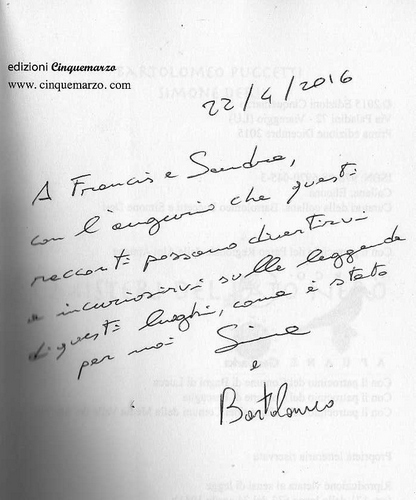 Together they have produced a book, published by Edizioni Cinquemarzo, Luca and Rebecca’s publishing firm at Shelley House in Bagni di Lucca Villa, called ‘I Misteri del Fato Nero’. (The mysteries of the black destiny). The great thing about this book is that it is not simply an academic collection of legends and stories about supernatural beings. 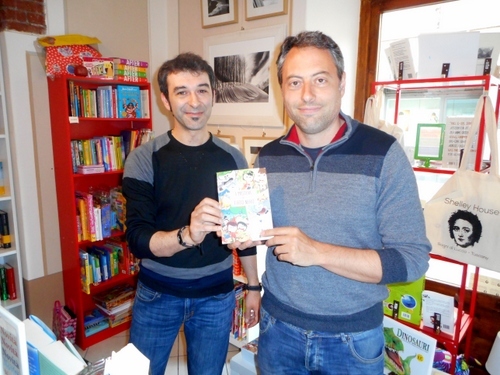 It’s a truly readable book to be enjoyed by both children and adults and written in quite easy Italian. The cover impresses with its illustrations by ‘I Forestelli’ animation studio who have created Italian-style Manga-type characters and several of their illustrations punctuate the book. The exciting thing about the black fate is that it actually exists. The wood of the black fate is a beech wood above Arni and situated at a height of 4,600 feet. It’s unusual that woods in this area get a specific name but surely this one merits it because of the strange happenings that go on within its bounds. Another great feature about the book is that each section is devoted to a historical or even prehistorical era. The first section is devoted to prehistory as far back as the Neanderthaloids. The second deals with myths and the third with history dealing from the Etruscans to the Romans. It’s indeed volume one since further books are promised leading one into the mediaeval and post mediaeval worlds. I’m not going to give away the contents of the sections except that Hannibal and his elephants make an appearance (yes, they really crossed the mountains a little above us, traces have been found both in archaeology and folklore) and rich treasure troves of gold lie hidden in unexplored caves. To improve your Italian here are a few of the terms used to describe these semi-invisible presences. 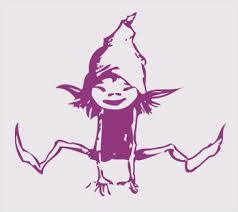 The linchetto is a type of elf inhabiting the areas of Lucca, Versilia and Garfagnana. The elf is not a bad spirit but he likes creating mischief. He gets into your house makes you lose objects and sometimes changes them, takes your bedclothes off at night (has special fun with newly-weds), and delights in driving you a little mad. He also enjoys giving you nightmares and weird visions. He is kind to children but can’t stand geriatrics. According to some historians the linchetto is a descendant of a faun, friend of the woodland god Pan. If your home is being haunted by a linchetto then the remedy to get rid of the pest is to hold a candle that has been blessed before him, or to hang a juniper twig on your front door. Also, efficacious is keeping a cupful of rice in your house. The linchetto can’t resist counting things and will spend all his time counting the rice grains until he gets fed up and goes away. There’s also a secret phrase which I won’t give away at this stage unless your house is desperately haunted by linchetti. 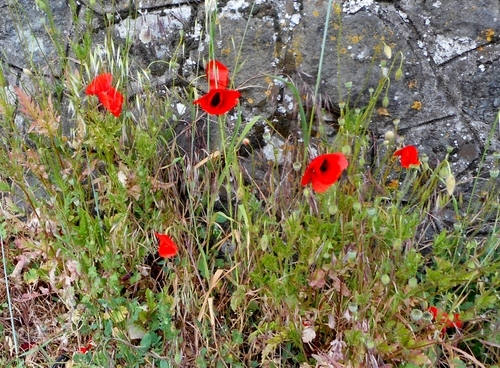 The buffardello also inhabits the same places as the linchetto but is especially common in Garfagnana. Sometimes he is known by different names. At Gorfigliano he’s called ‘pappardello’ and at Sillano he’s ‘piffardello’. The buffardello is a sub-species of elf but is rather less devilish and more boorish than the Linchetto. He does, however, have an unfortunate habit of stealing wine-bottles from your cellar. The remedy for getting rid of a buffardello is to close all windows, and take in all the washing in case he puts a spell on them. Juniper hung on the front door is also useful as is the usual blessed candle. If the situation is truly desperate then (I’m not having you on!) take a cheese sandwich to the loo and eat it while you’re doing your business and say ‘I’m eating a cheese sandwich and shitting on you’. Fata = fairy, fatina = small fairy. But there’s a tree, one of many, a single field which I have look’d upon …. Both of them speak of something that is gone: Whither is fled the visionary gleam? Where is it now, the glory and the dream? The foresters keep a book where sightings of linchetti and buffardelli and elfi can be recorded by visitors. 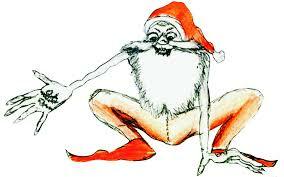 Don’t be embarrassed to do so if you see one of these elfin creatures. It won’t mean that you’ll be taken to see a psychiatrist, another of that dreaded horde of people who try to take your dreams away from you. Be grateful, instead that no sightings of bigfoots have been recorded in our Garfagnana forests as they have in other parts of the world (like North America) for bigfoots too exist and even the famous chimpanzee ethologist, Jane Goodall, firmly believes in them. I look forwards to receiving pictures from anyone who has photographed a linchetto or buffardello. To-date I tried to take a photo of one but the spiteful creature made sure my camera battery went flat! The Celts have arrived at Bagni di Lucca to celebrate the festival of Beltane! Tribes from the northern part of the peninsula have made their camp in the commune’s Parco Pubblico. Tents, bonfires and stalls have appeared, varieties of flutes are on sale and other ritual objects are on show. Fortunately, only animal sacrifices are promised. 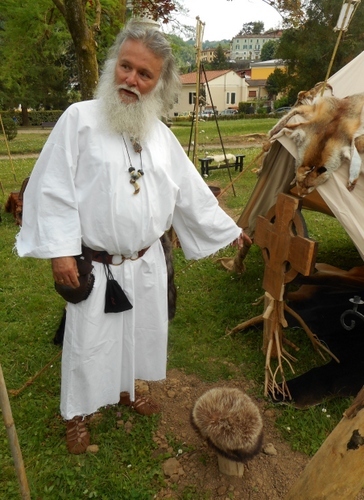 This druid has received his learning from the Celts who inhabit the northern islands of Great Britain and Ireland. 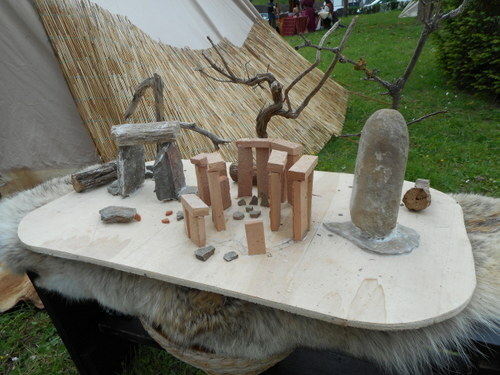 He proudly showed me his model of the inner circle of Stonehenge which his forebears have constructed. Of course, as a druid he has the right to enter the inner sanctum of this greatest of European prehistoric monuments on the year’s longest day. Lesser mortal may not tread within Stonehenge’s rigorously protected area although I note from my very early family photographs that it was once possible for everyone to do so, even with their pet dachshunds. How times have changed! What are the Celts doing in Bagni anyway? Don’t they live in northern Europe? They do now, pushed back into those remote parts of Europe Ireland, Wales, Scotland Cornwall and Brittany by persistent Roman conquests in the sixth century. Celts, however, originated in the mountains of present-day Austria where a magnificent culture, called Hallstatt after the area it was located, flourished. Here some example of handiwork from that civilization. As you can see, they were also horse worshippers. By the sixth century BC Celtic culture has reached its widest extent covering much of Europe including Italy where major settlements were founded in the Veneto region, in the Po valley and, nearer to us, in Liguria. Golasecca at the lower end of Lake Maggiore was a major Celtic settlement and acted as a bridge between Hallstatt and Etruscan culture. The salt imported from Austria mines (which can be visited to this day) provided Golasecca’s wealth. Milan itself was founded by the Celts who managed to defeat the Romans at the battle of Alia. Indeed, the Celtic tribe of the Cenones sacked Rome in 390 BC. The decline of the Italian Celts started in 225 BC when the Roman army defeated a considerable Celtic armed force at the battle of Talamone. From then on the Romans grew from strength to strength defeating the Celtic, Etruscan and Samnite alliance in the third Samnite war. By 192 BC the last independent Celtic kingdom in Italy was defeated by Rome’s crushing power. With that defeat the Celtic language in Italy was superseded by Latin, meeting the same fate as Etruscan. Today Celtic languages are spoken only in the north western reaches of Europe where they are divided into two groups: Celtic A in Scotland and Ireland, Celtic B in Wales, Cornwall, Isle of Man and Brittany. Celtic B is particularly widespread in Wales where it is the first language in many areas. Truly it’s the “iaith paradwys”, the language of heaven, particularly suited to song and poetry – a tongue, not easy to master but one which I have studied and learnt to love. Welsh continues to flourish today partly because of its ability to incorporate words from other languages. For example, the Romans who sought to conquer the principality in order to extract gold from its rocks and rivers gave it such words as “Pont” for bridge (c.f. Italian “ponte”) and “eglwys” for church (c.f. Italian “Chiesa and our “ecclesiastical”). forged in canyons and caves, and cut the staves. us in search of the largest fistulas. and shone on southern imagination. our lives feel this region’s winter coldness. But from the sky and the earth’s long amen. I don’t know how many Celtic words there are in Italian but certainly Celtic culture is enjoying a revival in northern Italy where many inhabitants show the characteristic Celtic DNA feature of blond hair and blue eyes. Incidentally, Otzi, the famous alpine frozen man was an early Celt and, interestingly, showed a characteristic Celtic custom of tattooing, something which has been revived in recent times as the beautiful tattoo decoration on the back of this latter-day Celtic maiden yesterday at Bagni di Lucca demonstrates. We are in modern-day Italy and so every event has to finish with a big eatery. Yesterday evening, tables were spread out in the piazza by the town hall and porchetta (sucking pig) was served with beer. The diners were serenaded by a Celtic harp player and actors. The same will be repeated tonight. The festival continues today so if you’re in the area don’t miss it. Here’s a rare chance to celebrate Beltane (Celtic for luminous fire) otherwise known as the Gaelic May Day festival where fire is worshipped and where walking on hot coals takes place! The Val Fegana is beautiful in all seasons but yesterday was an exceptionally clear winter’s day with true-blue sky and a golden afternoon light. I decided to take a little detour up the valley on my way home. Near the entrance I dropped into a friend’s place; the same friend half of whose garden had been swept away by the tremendous floods earlier this year when the river changed its course and decided on a short cut across his front lawn. With typical Dunkirkian spirit my friend had managed to restore everything as much as possible (fortunately the house wasn’t affected) although, clearly it was impossible to tell the river to go back to its original course. In place of the Muscovy ducks, (one of which we’d donated), swept away by a furious river, I found their replacement: two delightful geese revelling in the icy waters of a now reasonably placid Torrente Fegana. Continuing up this glorious valley I came across a pretty shrine, dedicated to the Virgin Mary, centrered around an ancient spring. Part of the shrine had only been completed this year. I’ve said before that I feel that Italy is a half-way country between the UK and India and, again, I could fully associate with the many shrines I’ve seen both in the sub-continent and here. It’s a marvellous fusion of Roman Catholicism with ancient nature adoration, the worship of woods and rocks. I remembered that the god of that eastern cult, imported into the Roman Empire, Mithraism, was born from a rock. In this instance, the Marian shrine appeared to be dedicated to fertility as the several blue rosettes celebrating male births attested. I was surprised to see no snow on the main Apennine ridge, not even on Monte Rondina, which is well above 6,000 feet. At this time the pass across it is usually impassable but now I could easily have reached Abetone on what must be one of the most spectacular unpaved roads in the whole mountain range. It’s the old grand-ducal road, built in the nineteenth century and which I have described in my post at http://longoio.wordpress.com/2013/06/10/festa-della-montagna-a-pian-dalbero/. Most of the road’s embankment stonework is still impressively standing. Just below the proud ridge village of Tereglio is this large manse which was a post-coach station for the Duke and his retinue. It is now, unfortunately in a state of abandon although, at least, the road has been diverted so that it no longer runs right in front of the entrance portico. Any takers? One of the delights of travelling in winter here is that new views are opened out for one since the trees have largely been despoiled of their foliage. The Orrido di Botri, Tuscany’s “Grand Canyon” is one of these “clarified” views. Reaching the Orrido the ascent to Montefegatesi began. The sun was now so low that it was difficult to steer my two-wheeler along the rough unmade track which has deteriorated considerably because of the seemingly perpetual rains we’ve had. But it was worth every effort and the views from another Marian shrine I encountered were superb. I also noted this crucifix on the adjacent telephone pole. Clearly, earthly communications must be protected too against all-too-frequent failures. The last stretch was the descent into the Lima valley and my home village of Longoio. On my way down I passed this rather lonely bus-stop and felt how much more pleasant it would be to wait here for a bus rather than at the stops in those overcrowded shopping streets of the world’s great metropolises’ pre-Christmas rush. Again, it was lovely to see the sunset colours against the mountain ridges – something which these photographs can only hint at. Travelling north to Castelnuovo di Garfagnana from Gallicano the Serchio valley narrows considerably, largely due to a spur coming straight down from the Pania Della Croce. At this point one can either proceed through a dim and dramatic gorge or find sunlight and great views by going over the spur itself (especially if one is heading for a meal at the incomparable Bonini’s). The crossroad at Bonini’s leads, to the left, to the high ranges of the Panie and a number of delightful villages. To the right there are also a couple of sweet villages which, in my opinion, are unduly neglected. I’d already known Perpoli since our choir sang there on such a wet Sunday that rain was coming down inside the campanile itself. (See my post at https://longoio.wordpress.com/2013/09/30/precipitous-perpoli/ for more information on Perpoli). The spur on which this tiny village is situated must have sported several castles due to its strategic position between the Luccan and the Estensi border and on a hill in the centre of Perpoli are the very overgrown remains of a fortress. We’d never visited Palleroso which is the other village on the spur until a week ago and were delighted by it. Unfortunately, both our camera batteries were flat (does this happen to others too?) so no photographs remain of that visit. When the sun peeped through yesterday I decided I’d have to return to Palleroso with a charged camera and was even more enchanted by this village, which is larger and more spectacularly placed than Perpoli. In fact, it’s built including a whole castle, hence the sign to it describing it as the mediaeval tower of Palleroso. Palleroso is surrounded by several places that together form what the villagers commonly call “la campagna”. These locations are Pianaccia, Santa Cristina, Canipaia, Buriconti, Pastine, Novicchia, and La Casina. The entrance to Palleroso is through a square dominated by the church of San Rocco (the patron saint of plague prevention) built when the village was preserved from a bubonic plague in 1630. One then proceeds through Via Tabernacoli and reaches a flight of steps leading to the castle entrance. The old gate was built in 1610 and the ground floor has a fountain, defensive slit windows, and an effigy of the Virgin. Upstairs is a room, formerly used by the Castilian which, over time, has served as a school building and as a municipal clinic. The street then leads onto the main square which has a wonderful viewing platform and a sweet parish church dedicated to Saint Martin. Its interior is quite elegant and very well kept. The church’s structure recalls romanesque architecture but, instead of a rose window, there is a niche with an image of St. Martin. In the apse is an oil painting by the eighteenth Venetian painter Giovanni Battista Lorenzetti representing the Virgin and Child, St. John the Baptist, St. Martin, Mary Magdalene and S. Ansano. There are a number of trails which I must explore soon when the weather improves. What I most enjoyed of my time at Palleroso (which some people say is a corruption of Paglia Rosa – rosy straw) were the 360 degree views from it. I was able to recognize many villages from it which appeared to me for the first time as they must look like to eagles. A local told me also that the Palleroso porcino and galletto mushrooms are the best flavoured in the area so that’s another reason for returning to this delightful village. Because of its very strategic border position Palleroso has quite an interesting history for a village of its size. The first historical documents date from the late twelfth century when in 1169 Berudico di Bolzano, leader of a small army, after conquering Gallicano, Barga, Cascio, Perpoli and Fiattone, destroyed Palleroso. In 1346 the Marquis Spinetta Malaspina-sold Palleroso to the Florentine Republic for just 12,000 gold florins. In 1370, Lucca managed to recapture Palleroso from the Florentines. In 1383 Lucca was again forced to surrender Palleroso to the Florentines. In 1384 a document notes Palleroso as having one of the most important castles of the Garfagnana. In 1451 Palleroso passed to the Marquis of Ferrara Borso d’Este and remained under Este rule until the formation of the Kingdom of Italy in 1861. In 1836 the road that leads to Monteperpoli from Castelnuovo Garfagnana was built (the one we still use today to get to Castelnuovo over the spur). In 1840 the village’s first aqueduct, “the Fontanino” was built. Palleroso was unfortunately caught up in WWII. By the autumn of 1944 and spring of 1945 the war front between the Italian Social Republic and Germany on the one hand and Anglo-Americans on the other stood in Garfagnana along the second Gothic Line that went from Pania della Croce to the Rocchette, and from there to Bruciano, Eglio, Sassi, Molazzana, Monteperpoli, Palleroso, the Bridge at Campia and, crossing the river Serchio, up to Castelvecchio, Treppignana and the Saltillo pass. In late August 1944, an American airplane fell in the woods near Palleroso. At the beginning of October the first bombs fell near Palleroso. On December 26, 1944, (at least they took Christmas off…) the Germans attempted an offensive against the Americans, recapturing Palleroso, and pushed up towards Barga and Gallicano, but the next day the Anglo-Americans launched a counter-attack. In February 1945 some bombs fell in Palleroso killing 30 civilians who were hiding in a shelter and the Chaplain of Castelnuovo. On April 18, 1945 Palleroso was occupied by American troops, and on Sunday, April 22 Mass was celebrated in the village church before a congregation who had now almost all returned from hiding in the mountains. So even this o-so-peaceful place has had to suffer the tortures and uselessness of war…. We continued our walk towards Pontremoli Main Square where the famous steles, which were the main reason for our visit, are housed in the undercroft of the town hall. We’d so much wanted to see them and now we were so close to them! We crossed a charming bridge over the river Magra which had to be reconstructed after the Germans blew it up in April 25th 1945. As the war in Italy finished on April 27th, with the hanging of Mussolini in Piazzale Loreto in Milan, this bridge must have been one of the last casualties of that war. Apart from this, we saw very little of war damage such as virtually flattened Aulla further down the valley. Indeed, the streets we passed through were full of character and reminded us that Pontremoli was once an important staging post for pilgrims on the via Francigena from Canterbury to Rome, and obtained much wealth from important pilgrims. One of its past travellers was Sigeric, who was abbot of Glastonbury. In 990 Sigeric travelled to Rome to receive his abbot’s authority from Pope John XV and the diary he kept of his itinerary provides one of the most valuable documents about the via Francigena and its precise route. On his death Sigeric was buried in Canterbury cathedral. The steles are normally on display in the castle of Piagnaro, just above the town, but since this was undergoing restoration they had been moved to their present location. Our initial disappointment at not being able to visit the steles in the castle were quickly allayed by the fact that they are displayed in a rather more suitable location here, in the deep recesses of the mediaeval undercroft of the palazzo municipal rather than being huddled together in a brightly lit room in the castle. What are these steles and what do they tell us of the civilization that produced them? They are classified into three groups A, B and C depending on their style and provenance, which is generally in the upper Lunigiana region. They unmistakably are burial memorials, very much like the traditional graveyard stones one gets in old English churchyards, and represent either male or female forms. The males always carry some dagger which is a symbol of their temporal power and class – the females have small petite breasts which indicate their importance in fertility ceremonies. Some steles have necks, others don’t. Some have even lost their heads, although their necks show evidence of jewellery, like torques. Eyes are downcast, faces are highly stylised and mouths are hidden, perhaps because they were considered the entrance to the soul which had to be heavily protected. More than this not much is known about them except that the steles extend in age from over four thousand years ago to the beginning of the Etruscan period around 300 BC. (One of these later ones has an inscription in a Ligurian-Etruscan language on it). Are there any connections between these steles and the rest of stone and bronze age Europe? A chart at the museum illustrated dolmens from Wales and the ring of Brodgar from Orkney, both of which we had visited, but stated that these other monuments had no human or anthropomorphic representations on them, although they were clearly part of a huge megalithic culture with frequent contacts between each other from as far afield as Malta to Orkney. However, both my wife and I were sure we’d seen something like these particular steles before. We racked our brains and realised that we’d seen comparable stones on an island in Lough Earne, Co. Fermanagh, Northern Ireland – Boa Island – which we’d visited in distant 1992 during an extensive visit around the emerald isle. In both cases the human shape is much stylised, and emphasis is given to the upper limbs. In both cases too, a few steles, appear to have been deliberately damaged or disfigured – in the case of Pontremoli by cutting some of them in half. Several of these steles were even used later as building stone for subsequent buildings and were discovered and recovered from them as recently as twenty years ago. Why the deliberate destruction? My opinion is that the steles, both Italian and Irish, represented the cult of ancient pagan gods which were subsequently deemed as unbecoming with the growth of Christianity. They became considered works of the devil and were either hidden or damaged. Whatever power they possessed once, whatever methods were used to disposess them of their esoteric powers the steles continue to hold an immense presence today. We both fell under their arcane magic and received strange pulsations from looking into their eyes, counting the fingers of their hands and just being with them alone. For there were few other visitors around when we met these petrified people from another age.